Leaders from the Florida Conference joined with thousands of other United Methodists around the world on April 6 to participate in a Leadership Summit webcast. The Summit focused on the results of the Call to Action Project, which conducted an assessment of the United Methodist Church in order to boost its vitality. The webcast, viewed at about 1,000 sites worldwide, was intended to begin discussions about the recommendations of the project. At Bishop Timothy Whitaker’s invitation, about 35 clergy and lay leaders gathered at the Conference Center in Lakeland to view the webcast and participate in small group discussions about what changes must be made to reinvigorate the congregations of the United Methodist Church. 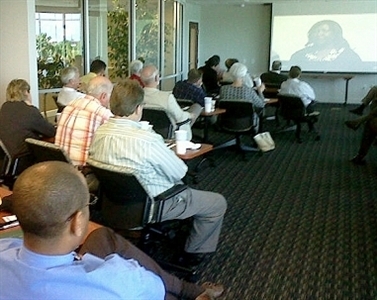 About 35 clergy and lay leaders in the Florida Conference watched a Leadership Summit webcast on April 6 at the Conference Center in Lakeland. Photo by Gretchen Hastings. The webcast originated in the studios of United Methodist Communications in Nashville. A panel composed of members of the Call to Action Steering Team explained the main concerns and recommendations of the team and later responded to questions and comments sent in via e-mail and Twitter. The members of the panel included Bishops Larry Goodpaster of the Charlotte Area, Gregory Palmer of the Illinois Area, Rosemarie Wenner of Germany and the general secretary of the Commission on Religion and Race, Erin Hawkins. Bishop Wenner said in an opening homily that being in mission for God will require becoming aliens in the culture around us. Research cited by the team suggested that high-vitality congregations share some things in common, including effective pastoral leadership, multiple small groups, programs for children and youth, a mix of traditional and contemporary worship services, and a high percentage of spiritually engaged laity who assume leadership roles. Reforming the Council of Bishops, with the active bishops assuming responsibility for improving attendance, professions of faith, baptism and other measures, and establishing a culture of accountability. Those discussions were the highlight of the Summit for the Rev. Bob Bushong, senior pastor of First UMC in Winter Park. “I didn’t hear anything new on the webcast, either in the reports or the comments, but the small groups were helpful,” he said. Bishop Whitaker said afterward that the webcast was about what he had expected. “I assume the purpose was to give United Methodists around the world the chance to be part of an ongoing conversation. So often, leaders are off somewhere else making decisions that seem to be distant,” he said.